Anthony Edwards grew up in a home where the five children were not allowed to watch television at night, so acting out was an important form of entertainment. He idolized Gene Kelly and hoped to grow up to be a "song and dance man". Edwards and a buddy, future actor Eric Stoltz, took ballet lessons to meet girls, and by the time he was 16 Edwards had appeared in dozens of musicals and plays. One of Edwards' first film roles was as "Stoner Bud" in the hit Fast Times at Ridgemont High, and his first starring role was Revenge of the Nerds. His breakout performance was as the ill-fated "Goose" in Top Gun, but he now says of the film, "Everything I hate about Hollywood is embodied by that movie. It's the idea that you have to succeed at any cost. If you have to kill your best friend, that is OK, as long as you are the best fighter pilot. It's a pure capitalism message gone mad." He met America's sweetheart Meg Ryan on the set of Top Gun, and dated and lived with her for two years. She reportedly turned down his marriage proposal before hooking up with her future ex-husband Dennis Quaid. 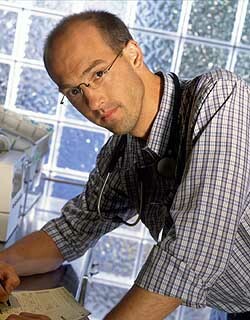 He is best known as the stressed-out Dr. Mark Greene on TV's ER, and he also played the omniphobic "bubble man" on Northern Exposure. Edwards has long been a supporter of people with disabilities, both as actors and otherwise. He volunteers for Cure Autism Now (CAN), and has been a member of his home town theater, Santa Barbara's Access Theatre, which works with disabled actors. Following his departure from ER, Edwards moved his family to Manhattan. He says he considers himself "smaller than life", and doesn't lead a lifestyle that keeps him on the cover of tabloids.